'The protagonist of Marian Maguire’s new print series, Titokowaru’s Dilemma, is an impressive figure who embodies the complexities and contradictions of nineteenth-century New Zealand history. Tītokowaru was a trained Māori tohunga but a Christian convert; an advocate of peace but an outstanding military strategist; a powerful and charismatic leader but one who lost the support of his followers. Rather than simply confusing us, these diverse characteristics offer a more nuanced understanding of Tītokowaru than we might have of more conventional early New Zealanders. And it was this that made him an absorbing subject for Maguire, whose prints exploring colonial history challenge simplistic readings of the past. Living in the Taranaki district, Tītokowaru was involved in battles against the British in the early 1860s, but then led a number of important initiatives promoting peace with settlers. When continuing land confiscations pushed Māori into war to avoid starvation, he first resorted to plunder without bloodshed then, in a situation of escalating conflict, deployed an effective combination of fear-provoking propaganda, clever field-engineering and guerrilla tactics to overcome British troops far superior in number to his own. The unexpected dissolution of Tītokowaru’s army in 1869 after a series of victories, reputedly because he undermined his mana by sleeping with the wife of an ally, did not diminish his reputation among settlers as a formidable opponent, and an uneasy peace was maintained. Further land deprivations led to a campaign of passive resistance in which Tītokowaru took part alongside Te Whiti and Tohu. Resistance was finally quashed in a massive show of force by the British at Parihaka in 1881, which decimated Māori power in the area and saw Tītokowaru imprisoned a number of times before his death in 1888. In these prints, Maguire continues to develop her distinctive imagery drawn from ancient and colonial sources. The bold silhouettes of Greek vase paintings are particularly evident in her black-and-white etchings, such as those depicting amorous adventures involving Greek gods, Māori maidens, satyrs and settlers, in a series entitled Colonial Encounters. In the large colour lithographs of Titokowaru’s Dilemma, figures of similar style and clarity are set into New Zealand landscapes based on colonial paintings and photographs. 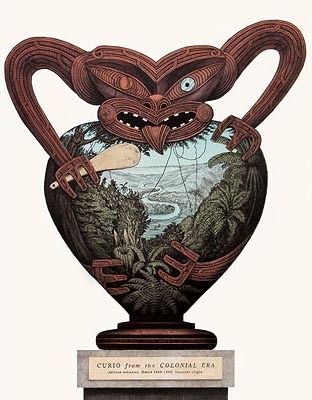 In Maguire’s intriguing cultural crossovers, we find such unexpected meetings as Socrates in discussion with Tītokowaru, Persephone keeping company with Hine-nui-te-pō in the underworld, and Zeus stalking Papa in a Whangarei landscape. Figures are transposed into unexpected historical settings, with Gustavus von Tempsky dying on the battlefields of Troy, Venus de Milo taken captive in a Māori pā, and the Christchurch statue of Captain Cook entangled in rata roots in the Taranaki bush. Such intriguing visual inventions continually surprise and delight us, and tease our imaginations with human connections across time.